Bank account transfer letter : Hello Friends, Is post me hum aapko Application for Bank Account Transfer in Hindi – khata transfer karne ke liye letter format batane ja rahe hai jisme hum aapko SBI, Punjab National Bank, Central Bank of india etc. 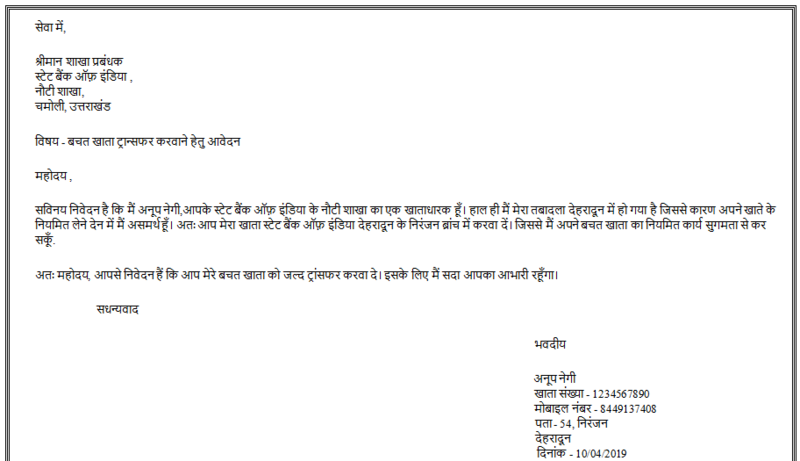 all bank account transfer application letter format niche is post me provide karne wale hai to dosto chaliye suru karte hai account transfer application. सविनय निवेदन है कि मैं अनूप नेगी,आपके स्टेट बैंक ऑफ़ इंडिया के नौटी शाखा का एक खाताधारक हूँ। हाल ही मैं मेरा तबादला देहरादून में हो गया है जिससे कारण अपने खाते के नियमित लेने देन में मैं असमर्थ हूँ। अतः आप मेरा खाता स्टेट बैंक ऑफ़ इंडिया देहरादून के निरंजन ब्रांच में करवा दें। जिससे मैं अपने बचत खाता का नियमित कार्य सुगमता से कर सकूँ. To dosto kesi lagi aapko yeh post Application for Bank Account Transfer in Hindi – बैंक अकाउंट ट्रांसफर लेटर hame comments kar ke jaroor bataye or is application ko apne un dosto ke sath share karna na bhule jinko is application ki jaroorat hai.